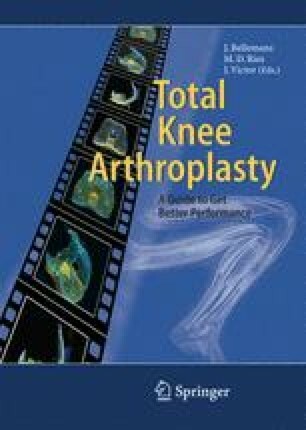 The structure of the knee is complex, and its behavior can be unpredictable even in the most experienced hands. However, the task of replacing the bone surfaces and balancing the ligaments can be made manageable by following a logical plan based on correct alignment throughout the arc of flexion and ligament release based on the function of each ligament. Optimal knee function requires correct varus-valgus alignment in all positions of flexion. This requires reliable anatomical landmarks for alignment both in flexion and extension. The long axes of the femur and tibia and the anterior-posterior axis of the femur are highly reliable and provide the guidelines for establishing stable alignment of the joint surfaces by placing the tibia and patellar groove correctly in the median anterior-posterior plane through the entire arc of flexion. Ligaments perform specific functions, and these functions differ in different positions of knee flexion. Knowing their function and testing their tension provides the information necessary to release only the ligaments that are excessively tight, leaving those that are performing normally. Fractional release does not destabilize the knee, because other ligaments are retained, and because the peripheral attachments of the ligament to other soft-tissue structures such as the periosteum or synovial-capsular tissue allow the released ligament to continue to function. Ligament release does not cause instability. Failure to align the knee and release the tight ligaments, however, does cause instability, unreliable function, and excessive wear. With this knowledge, good instruments, and sound implants, the surgeon can align, balance, and stabilize the knee even when severe bone destruction and ligament contracture are present.